Lonnie Wheatley, SAPULPA, Okla. (August 20, 2015) – There’s nothing like a little home field advantage. 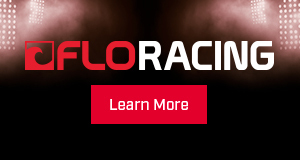 Or in this case, home track advantage. 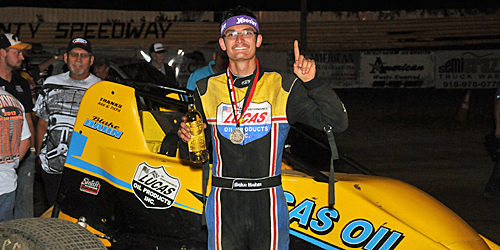 It paid off to the tune of $2,500 for Sapulpa, Oklahoma’s Blake Hahn as he slipped by Brady Bacon on the white flag lap en route to topping round two of the USAC Southwest Sprint Cars “Freedom Tour” on Thursday night at Creek County Speedway. “I grew up here, this is the first track I raced at, this is awesome,” Hahn stated in awe after capturing his first non-wing Sprint Car feature win. After battling his way past Casey Shuman and Ryan Bernal to take command of second on the 21st round of the 30-lapper, Hahn had to take the win from another driver that is quite familiar with the Creek County oval; Broken Arrow native and reigning USAC National champion Brady Bacon. Following the inevitable Creekadega big one on the initial start, Bacon wrestled the lead away from Andrew Deal on the second lap and was seemingly en route to his second “Freedom Tour” score at Creek County in as many years. A final caution with eight laps proved to be a game changer. While the leaders worked to navigate a narrow turn three and four cushion, the upper portion of the track in turns one and two began to fade away in the closing rounds. While Bacon moved to the bottom of one and two for a couple of laps, he eventually moved back up the track. And when he bobbled exiting turn two on the 29th circuit, Hahn cashed in right away aboard the Lucas Oil No. 52 machine. Hahn raced on to the checkered flag with Bernal moving into second when Bacon grazed the wall exiting turn two on the final circuit. Bacon settled for third after leading 27 of 30 laps with Shuman and Deal rounding out the top five. Heat Winners (starting position in parentheses): Ryan Bernal (2), Andrew Deal (3), Casey Shuman (4), Brady Bacon (4). Heat Moments: While Bernal and Deal both lead throughout, Shuman worked his way around R.J. Johnson in the closing laps of the third heat to rank as top points earner with Bacon matching him in the fourth heat with a late move around Koby Barksdale. “B” Main Moments: Mike Martin rebounded from an opening lap tangle to capture the third of four transfer spots as the track slicked off quicker than some were expecting; Fifth and sixth-place finishers Shon Deskins and Casey Wills were added to the feature via promoter’s option. Initial Start – The red lights lit up right off the bat when front row outside starter Kyle Clark got out of shape in front pack in turn two with Harli White, Shannon McQueen, Charles Davis, Jr., Fred Mattox and Tye Mihocko among those collected in the melee. McQueen, aboard Michelle Decker’s No. 7, and White were both done. 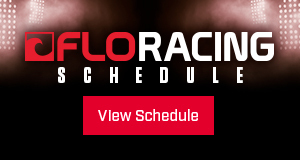 Six laps – With 360 spin caution rule in effect, the yellow flies for a Casey Wills 360. 17 laps – Tye Mihocko coasts to a stop in turn four with front end damage. Sign language to his new favorite driver followed. 22 laps – Mike Martin executes a nice 360-degree spin exiting turn four to bring out the final caution. “A” Main Hard Charger: Shon Deskins made the most of his promoter’s option starting position by climbing 11 positions from 21st to tenth. Best Supporting Role: Kevin Bayer topped an entertaining POWRi West Midget feature, testing the cushion all the way to take the checkered flag just ahead of Andrew Felker and Matt Sherrell. 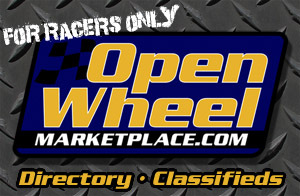 Check out the full POWRi West Midget recap and results on MidgetMadness.com at http://www.midgetmadness.com/bayer-conquers-creek/. Heat One (10 Laps): 1. 56-Ryan Bernal (2), 2. 52-Blake Hahn (4), 3. 5-Tye Mihocko (1), 4. 17w-Harli White (5), 5. 20-Shon Deskins (3), 6. 19-Andrew Reinbold (7), 7. 5h-Cameron Hagin (6). Heat Two (10 Laps): 1. 31d-Andrew Deal (3), 2. 11w-Wyatt Burks (6), 3. 84-Alex Decamp (1), 4. 7-Shannon McQueen (5), 5. 7f-Michael Tyree (4), 6. 29-Michael Bonneau (7), 7. 15-Gavin Stout (2). Heat Three (10 Laps): 1. 4j-Casey Shuman (4), 2. 77m-R.J. Johnson (3), 3. 9$-Kyle Clark (7), 4. 26m-Fred Mattox (1), 5. 13-Dennis Gile (5), 6. 53-Brett Wilson (2), 7. 13w-Grant Wresche (6). Heat Four (10 Laps): 1. 99-Brady Bacon (4), 2. 22-Koby Barksdale (2), 3. 5$-Danny Smith (3), 4. 78-Chris Bonneau (6), 5. 50-Charles Davis, Jr. (5), 6. 16-Mike Martin (1), 7. 31-Casey Wills (7). “B” Main (12 Laps): 1. 50-Charles Davis, Jr. (2), 2. 13-Dennis Gile (1), 3. 16-Mike Martin (9), 4. 19-Patrick Stasa (4), 5. 20-Shon Deskins (6), 6. 31-Casey Wills (8), 7. 53-Brett Wilson (7), 8. 5h-Cameron Hagin (10), 9. 7f-Michael Tyree (3), 10. 29-Michael Bonneau (5), 11. 13w-Grant Wresche (11), 12. 15-Gavin Stout (12). “A” Main Finish (30 Laps): 1. 52-Blake Hahn (7), 2. 56-Ryan Bernal (1), 3. 99-Brady Bacon (5), 4. 4j-Casey Shuman (6), 5. 31d-Andrew Deal (3), 6. 5$-Danny Smith (11), 7. 22-Koby Barksdale (9), 8. 84-Alex Decamp (15), 9. 9$-Kyle Clark (2), 10. 20-Shon Deskins (21), 11. 77m-R.J. Johnson (8), 12. 16-Mike Martin (19), 13. 19-Patrick Stasa (20), 14. 78-Chris Bonneau (10), 15. 13-Dennis Gile (18), 16. 26m-Fred Mattox (16), 17. 50-Charles Davis, Jr. (17), 18. 31-Casey Wills (22), 19. 5-Tye Mihocko (14), 20. 17w-Harli White (12), 21. 7-Shannon McQueen (13), 22. (DNS) 11w-Wyatt Burks (4). Lap leaders: Andrew Deal 1, Brady Bacon 2-28, Blake Hahn 29-30.